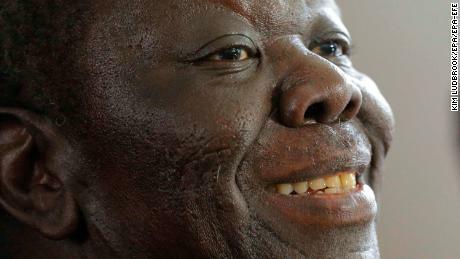 Morgan Tsvangirai, Zimbabwe’s longtime opposition leader and former Prime Minister, has died in a South African hospital at the age of 65, according to MDC party spokesman Nelson Chamisa. Tsvangirai had been in and out of hospital since disclosing in June 2016 that he had colon cancer. He returned to Johannesburg for another round of treatment in early January. Tsvangirai was the veteran leader of the Movement for Democratic Change, and one of the most prominent critics of the former Zimbabwean strongman Robert Mugabe and his ruling ZANU-PF party. His death greatly increases the power of ZANU-PF ahead of elections later this year. Emmerson Mnangagwa, who took over as President and ZANU-PF leader after Mugabe’s resignation last November, will be the heavy favorite to win the vote. Tsvangirai was born the eldest of nine children in a working-class family and was a miner for many years. He joined ZANU-PF in 1980 after Zimbabwe’s independence and rose quickly through the ranks. Tsvangirai addresses an MDC rally in Mutare in 2000. In 1989 he became secretary general of the Zimbabwe Congress of Trade Unions, emerging as opposition leader in 1997 and forming the MDC two years later. The MDC adopted the symbol of the open palm to express opposition to the closed fist of Mugabe’s party. Often, its members bore the brunt of the brutality from ZANU-PF and the government-controlled police force and army. In 2007, the world was shocked to see pictures of Tsvangirai’s injuries after he was beaten by police for taking part in a prayer meeting that authorities said was illegal. Over the years, he was arrested repeatedly and accused of treason and plotting to assassinate the President, among other charges, but was never convicted. He continued to serve as the head of his party and to stand against Mugabe in various presidential and parliamentary elections. Tsvangirai (L) and Mugabe (R) pictured in 2013. Tsvangirai was the main challenger to Mugabe in 2008 elections, and managed to win 47% of the vote against ZANU-PF’s 43% in the first round, sending the vote to a runoff. But Tsvangirai pulled out of the second round, declaring he could “no longer participate in a race that’s been marred by the widespread intimidation, torture, mutilation and murder” of his followers. The two longtime rivals signed a power-sharing deal that allowed Mugabe to remain President and made Tsvangirai the prime minister in a unity government from 2009 to 2013. But just days after being sworn in, Tsvangirai and his wife, Susan, were involved in a horrific car accident. Tsvangirai walked away from crash, but Susan was killed. Tsvangirai challenged Mugabe again in the 2013 election but lost. He alleged widespread fraud but withdrew a legal challenge to overturn the outcome. In the years to come, Tsvangirai would spend less time in the spotlight, and his dream of a peaceful and democratic transition of power from Mugabe was never realized. His arch foe was eventually removed from power by his own party last year, but for Tsvangirai, whose health was declining, it was already too late.